Hello I Am a Monkey. How About You? It’s good to know what sign you are, to eat accordingly. BBC GoodFood can help with this. I like what they advise for me. One can also explain why just Christmas ham wound up on the Christmas smorgasbord. The wild boar was probably tamed sometime during the Bronze Ages. Its meat was tender and succulent and soon became the cult animal of the Vikings. Valhalla was the Vikings paradise and where warriors met to hold nightly feasts. Every night they dined on a special boar named Sarimer which was roasted over an open pit. Beautiful amazons served mjöd, a beer brewed from honey and hops, to the warriors. Then, abracadabra, each morning lively little Sarimar reappeared in his pen once again, grunting happily and eagerly awaiting a new slaughter for the evening feast. The Fast Food Feminist posted a collection of links to sugar plum recipes last year around this time – along with some philosophic musings. Does sugar have more than one flavor or bite? I decided to look to sugarplums for wisdom. Sugarplums are thought of as a Christmas sweet – though many people have never seen or tasted one. What are they? Fast Food Feminist put on her detective hat to find out. Food Reference.com tells us that sugarplums were originally sugar coated coriander, rather like the sugar coated seeds which many know from the end of a meal at an Indian restaurant. In olden times these were called “comfits”. Comforting things. tells us that Queen Isabella and Benjamin Franklin loved sugarplums. I’m not sure whether that fact will make me run out to chow down on some, though the examples shown are well-rounded and solidly bourgeois and even look as if one alone might make a delicious meal. has a different take on the sugarplum, saying they may have been actual plums preserved in sugar. I wish sugar could preserve me, too, but so far there is no proof that this could occur. website has an excellent recipe for sugarplums made in the Victorian fashion (always so jolly, you know) that includes crystallized ginger, which I personally adore. It’s pretty fast to make, too. will likely swear by the recipe provided in their forums. who this year did not make sugarplums at all but who instead provided sweetness in life through cranberry-pistachio bark, a recipe I too know and love, as much for its fastness as for its foodie-ness and imagined femininity though of course one does have to imagine a bit to guess at that. 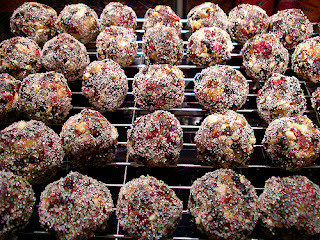 knows sugarplums as wild plums to be gathered from the fertile earth, then to be carefully laid out, sugared and dried. A simple feast, an earthy thing of honor. speak of the same ingredients and technique for sugarplums as Saveur does. Which brings to mind the question: Does a rose by any other name smell as sweet? gives us a recipe for Sugarplum Tofu with Udon. Another way of sweetness, this one with a corporate relations link at the top of the page. Sugarplums are many things, of differing varieties. Therefore sugar apparently is as you like it, if we follow the wisdom of sugarplums. There have been a few changes since last year: Whole Foods changed the title of their recipe to not include the word ‘sugarplum’ but rather just ‘plum’. I wonder why. Was the word ‘sugarplum’ just a bit too perky for Whole Paycheck Foods? Oh well. Likely we’ll never know. And the link to the sugarplum recipe from Diary of a Kentucky Cook is now here. Sugarplums always start their rounds this time of year – the visions of them created by the well-known poem, dancing round in our heads – is so warming, so old fashioned, so slow food. But sugarplums are fast food. They are so easily made in the home kitchen today. Most recipes are just chop stir shape for the most part. It’s funny to think of sugarplums being fast food. Now if I had to grow the ingredients that went into them, or if I had to dry or shell things, or chop down sugarcane or even peel and distill the stuff to make sugar, then to my mind sugarplums would be slow food. Actually I’m sort of glad that sugarplums are fast food. I don’t have a whole lot of time around the holidays and no wish to wear an apron (or chefs coat for that matter) for two or three weeks straight. So I will dream of fast food tonight. Sugarplums. They dance in my head, and rather quickly too! Load Your Plate with Jingo-istic Sentiment – It’s TURKEY DAY! The countdown has begun. The plans are being discussed. The larders (that means cupboards and refrigerators for those of you who prefer modern speech) are being filled and filled and filled. It’s the Day to Be Thankful. Or (more commonly) the Day to Get Stuffed Till You Hurt. Add a pinch of the usual dissonances that happen when family (sorry, Family) must gather from all their own homes to the Gathering Place of Holiday and what you have is Thanksgiving. Thanksgiving Day used to be the start of the Holiday Season. It was the date on which one could expect to have to start worrying about gifts, money, food, people, other people, parties, diets, party clothes, decorations, credit card debt, wrapping paper, ribbons and tape, red tape, lines at the stores, malls with parking lots the size of small cities, office gatherings filled with charming lechery from the least charming people who’d slugged down a bit too much punch (make that wine – punch is ‘out’), plans for alliances and non-alliances, health club memberships for the New Year when one would get Skinny and Gorgeous, and what stuffing would be served and with what on what day. Ham, Turkey, Roast Beef. We need large ones. We need Heirloom ones. (I always think of the turkey-pluckers on these days, their fingers chilled as those pinfeathers continue to stick even after the boiling water dipping machine and the tossing around like a whirlwind feather-removing machine have done their industrial jobs yet not well enough, not well enough for whatever-price per pound these babies are costing their investor-eaters). We need Brussel Sprouts, and God Only Knows Why. Thanksgiving is not the start of the holiday season anymore – Halloween holds that place of honor as the plans grow more startlingly consumptive (yes, two meanings to that word!) and well-caramelized. We have a lot to be thankful for. But let’s get real. Are we really celebrating an American Traditional Thanksgiving at our tables with this meal of choice and habit? Or . . . is it all a little trick played on us? Could it be that a writer invented this holiday as we know it and celebrate it, and that somehow we have simply forgotten the real way of the holiday in an excess of the sort of jolly jingo-istic sentiment that seems to grab the masses by the throat heart, and with the soft prettiness of it all manages to serve up a paint-the-kitten-on-velvet-by-numbers kit for dinner? One does like things to be nice nice. Nice nice is so nice. “While we have been able to work out which modern dishes were not available in 1621, just what was served is a tougher nut to crack,” Ms. Curtin says. That makes for a different sort of table, a bit. Then how did this reality of a holiday which-is-not actually occur? “[Hale’s] depiction is wrong much more often than it’s right,” says Nancy Brennan, president of Plimoth Plantation. So. Is it Turkey Day or is it not? I’d say it definitely is Turkey Day in some ways. In more ways than one. In the final analysis one must gather one’s turkeys where they may, as they batten the hatches momentarily against the onslaught of the rest of the ravaging hoolidays holidays to come along on the rampage in short shrift. One of my favorite questions in the whole wide world is raised by all this. The question is: What is real? When it looks really pretty and nice, it’s worth poking at to be sure it is true. Or even real. Enjoy your bird no matter the feather! Even if you are quietly thankful, and choose to not stuff yourself or any bird, fish or fowl whatsoever. Eat what you like, for the day belongs to you – not to some dead editor of a ladies magazine who lived a long time ago. appears to be quite American after all.